This is a four-channel temperature measurmet adapter that works without external power supply. It will suitable for measureing temperature and logging its data with a PC. The circuit diagram is very simple and no adjustment is required, everybody will able to build it with ease. These great project created by ChaN. 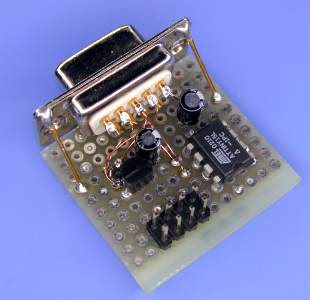 “I chose an Atmel ATtiny15L for this project. It is the only device that has a built-in 10bit A-D converter in the 8 pin AVRs. The A-D converter has a bandgap reference and differencial amplifire as its front-end. The AVR core is clocked by only internal RC oscillator (calibrated to 1.6MHz), any other clock souce cannot be used. Also 25.6MHz clock source that 16x multiplied from core clock is available for timer/counter. This means that a fast PWM output can be generated. Therefore the ATtiny15L has good analog I/O capabiltity.